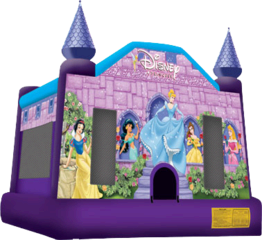 The fairy tale is realized in this licensed Disney Princess bouncer, fit for any princess, no matter the occasion. Cinderella, Snow White, Sleeping Beauty, Belle, Jasmine, and Ariel are smiling down as participants enjoy enchanting fun and imaginative play! Ideal for a birthday party or kid-filled event, participants can jump for hours on end, which makes the jumper a great way to promote fitness and entertainment!